Under international pressure and in front of strong Palestinian popular resistance on the ground, yesterday night Israeli courts decided on a stay for the destruction of the Bedouin community until July 11. This is not much time but allows us to continue to build pressure internationally and support for the community on the ground. Call your consulate to urge them to protest the illegal planned population transfer of the Israeli occupation and to go to Khan al Ahmar now to witness the ethnic cleansing! 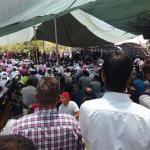 In the meanwhile, over 1000 Palestinians have gathered today in Khan al Ahmar to show their support for the community. They held the Friday prayers together and then marched onto the main road passing close to Khan al Ahmar and blocked it. The road is one of the main access roads for the settlements from the Jordan Valley to reach occupied Jerusalem.